There was a big party in Anaconda, Montana, on October 9, 1937. It was the gala opening of Club Moderne. 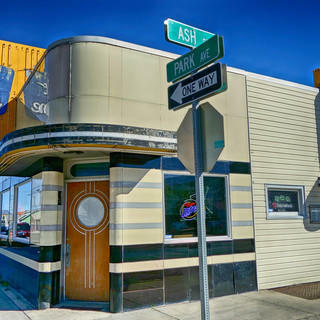 The bar was—and still is—a sight to behold, with its rounded front facade and Carrara glass panels that perfectly embody the Art Deco style of architecture popular in the U.S. earlier last century. 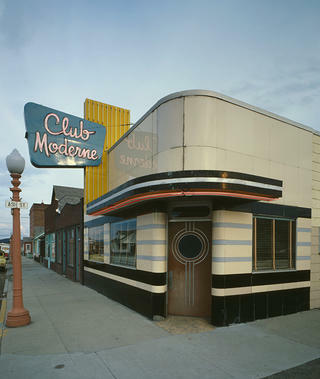 Club Moderne was built under the direction of owner John “Skinny” Francisco. The building was designed by Bozeman, Montana-based architect Fred Willson and built by local carpenters and craftspeople. It was a family-run affair from the very beginning. And when the Francisco family put the bar up for sale in 1997, it went to the closest thing to family: long-time bartender and Anaconda native John Hekkel. When Hekkel took over ownership of the bar, it was in perfect condition. “Just like it is now,” he says. Club Moderne has changed very little since its 1937 opening day. It received modest renovations in 1948. In 1986, it was added to the National Register of Historic Places. Today, the interior still has its original woodworking and hardware, plus its long-time leather furniture and Formica tables. Outside, its original sign and neon details remain intact. Yes, the bar has a place in Anaconda’s history. (“If these walls could talk…,” Hekkel says.) And its architecture brings Art Deco fans from all over. But those aren’t the only things Hekkel loves about it. You’re having: Keep it simple. Order whatever’s on tap. Or try a Moscow Mule, which Hekkel says is a specialty of his city. 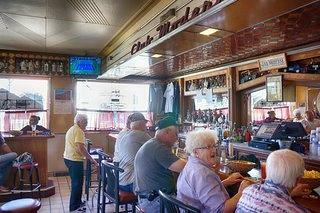 Club Moderne has been serving Anaconda, Montana locals and visitors since 1937. Club Moderne's original Art Deco facade remains remarkably intact.